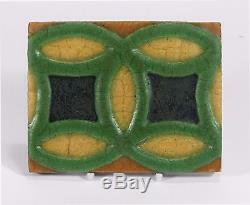 Here is a very good Grueby Pottery tile with a geometric design of double rings in four colors. 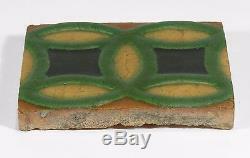 The matte glazes are nicely curdled and the green ring design is in relief against a yellow and butterscotch ochre background with dark blue centers. 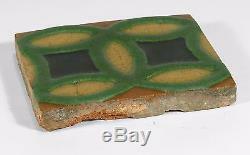 The tile measures 6 inches by 4 5/8 inches and 3/4 inch thick. 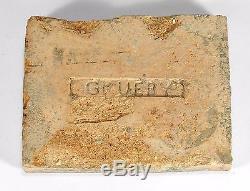 It is in great condition with only one nick on the edge of the face, and no cracks, repairs, or firing flaws. Some clay losses on the back and to the edges. Impressed on the back GRUEBY. A nice example of Boston's premier New England Arts & Crafts tile maker. 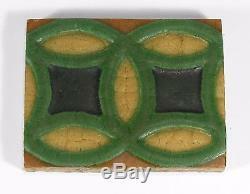 The item "Grueby Pottery 4 color ring tile matte yellow green brown blue Arts & Crafts" is in sale since Thursday, April 6, 2017.